FILE - A U.S. Marine takes part during a training session for Afghan army commandos in Shorab military camp in Helmand province, Afghanistan, Aug. 27, 2017. The Pentagon says it did not intend to restrict the release of crucial information about U.S. and coalition efforts in Afghanistan, blaming a "human error in labeling" for the withholding data. The response came after the top U.S. watchdog on U.S. efforts in Afghanistan issued its quarterly report to Congress on Tuesday, harshly criticizing military officials for censoring information on the number of districts under control of the government or insurgent groups like the Taliban. 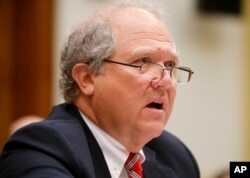 "This development is troubling for a number of reasons, not least of which is that this is the first time [the inspector general's office] has been specifically instructed not to release information marked 'unclassified' to the American taxpayer," said John Sopko of the Special Inspector General for Afghanistan Reconstruction, also known as SIGAR. But officials with Operation Resolute Support, the NATO-led training, advisory and support mission, said Tuesday that the failure to share the data was a mistake. "It was NOT the intent of Resolute Support to withhold or classify information which was available in prior reports," Resolute Support spokesman Captain Tom Gresback said in a statement. "A human error in labeling occurred," he said, pointing to confusion about terms that the U.S. and NATO use differently. "The data is not classified and there was no intent to withhold it unnecessarily." According to Resolute Support, as of October 2017, the government retained control or exerted influence over about 56 percent of Afghanistan's 407 districts. Another 30 percent remain contested and about 14 percent are under the control or influence of insurgents, like the Taliban. Despite the statement from Resolute Support blaming human error, officials with SIGAR said Tuesday that they had yet to receive any of the additional data. John F. Sopko, special inspector general for Afghanistan Reconstruction (SIGAR), testifies on Capitol Hill in Washington before the House Foreign Affairs subcommittee on the Middle East and North Africa. "If true, that's great. I'm glad they finally came to their senses," Sopko said of the U.S. military's about-face on withholding the information. "It's unfortunate that they only did so after the press started to ask questions," he added. "We hope now they will release all the other important information they have unreasonably withheld from the American people." SIGAR's previous quarterly report, issued in October, found the Afghan government exercised control or influence of over 56.8 percent of the country's 407 districts, while 30 percent of the districts were contested, and 13.3 percent were under the control or influence of insurgent groups. In a statement that accompanied the October 2017 report, SIGAR said the Afghan government's control had "deteriorated to its lowest level since SIGAR began analyzing district-control data." In a tweet Tuesday, SIGAR called the district control numbers "one of the last publicly available indicators for Congress — many of whose staff don't have access to classified info — & for American people to know how US effort in #Afghanistan going." Even without having the latest data on the extent of government or insurgent control across Afghanistan, the new SIGAR report painted a bleak picture of U.S. efforts to secure the country, more than 16 years after the U.S. invaded the South Asian nation following the September 11, 2001, terrorist attacks. The report found the recent increase in U.S. military attacks on the Taliban and other insurgent groups had failed to bolster the Afghan government's control over its population. In October alone, the U.S. dropped 653 munitions on enemy combatants, a record since 2012 and three times the figure from October 2016, the report said. The report also noted U.S. casualties were increasing, with 11 service personnel killed in the first 11 months of last year, twice the number killed in action in the same periods in 2015 and 2016. 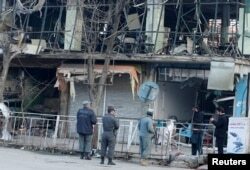 FILE - Afghan policemen inspect the site of a bomb attack in Kabul, Afghanistan, Jan.28, 2018. Nor does the increased U.S. military support seem to be generating much optimism among Afghan citizens for any sort of resolution, the report said. The report noted the Asia Foundation, which promotes the improvement of lives across the continent, found in its annual survey that only slightly more than half of Afghan respondents believed that reconciliation with Taliban insurgents in the country was possible and that about 16 percent of Afghans had "a lot" of or at least some sympathy for the Taliban. Additionally, there are concerns about the effectiveness of $8.7 billion in U.S. aid for counternarcotics efforts in Afghanistan. SIGAR said Afghan opium production was up 87 percent in the last year and land under opium cultivation rose by 63 percent, both all-time highs. Other concerns include what SIGAR described as unrealistic expectations for the development of Afghanistan's untapped mineral resources, saying efforts have been "stymied by insecurity, corruption, weak governance and a lack of infrastructure."